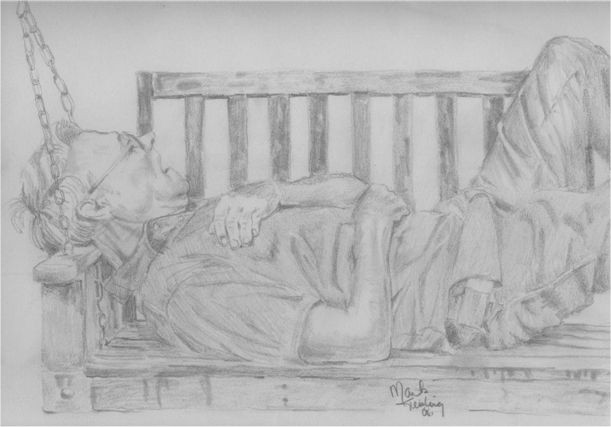 Lewis Smith of Livingston was caught napping in a recent photograph made this summer. Mark used the picture to do this remarkable pencil drawing. Sometimes natural abilities that someone might possess don't often come to light until that person reaches adulthood. That's the case with Mark Keisling. Mine and Mark's paths crossed by accident recently, and I was amazed by the wonderful talent he has, and only just recently began to devote a lot of time to. 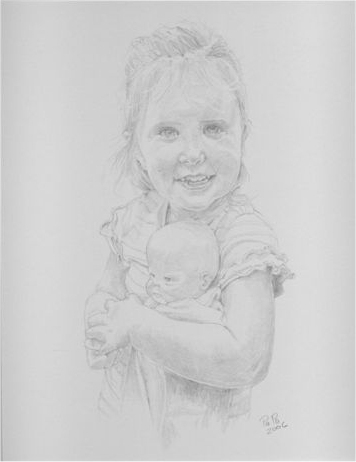 Mark is a very gifted artist and one who specializes in portraits done by pencil. He works from photographs, but does not limit his work just to portraits. He will do family pets, as well as homes, and even churches. He work with acrylics and does oil paintings too. A little background information about Mark includes the fact he is one of eight children, six boys, two girls, whose parents are Doug Keisling and wife Nell Keisling of Livingston. Many will remember Mark's father, Doug, who served as the Veterans Service officer for this area for many years. Mark is second in the lineup of children. All eight kids can be considered Navy Brats since each one of them was born at various Naval bases during the time their father was in service. Mark grew up in Charleston, South Carolina, and attended school in nearby Summerville, a town known as Flower Town USA. He took basic art classes beginning with seventh grade and on through high school too, but that was the extent of his exposure to the art world. While living in South Carolina, a Sunday School teacher he had encouraged him to use his talent in art, and often had him to do art projects relating to church programs. When Mark was 18 years old, the Keisling family moved back to their father’s hometown of Livingston. After serving in the United States Navy for 3 years, Mark's working career included 23 years of factory work. During that time, he met and married Brenda Shoup. They are the parents of four children, one daughter, Mary, and three sons, John, Stephen, and Michael. Their family has now grown to include six grandchildren with another one on the way. During the years of raising a family and his working career in a factory, Mark's interest in art lay dormant. Recently with wife Brenda's encouragement, and the desire to do something with his life other than factory work, Mark has begun to make more use of his natural artistic abilities. Through the use of advertising by way of the internet, Mark has gotten some orders for portrait work. He strives very hard to capture what he considers "the real thing" in his work. He often has his young granddaughter, Aubrie, age 3, to see if she can identify the person he working on, especially if the person he's doing is someone she's familiar with. Each time Aubrie has been asked the question "who is this? ", she knows exactly who her Pa Pa has so skillfully drawn. Mark's portrait business has not reached the point just yet that he can make a living that way, so in the meantime, he works in the pallet business, and also does some ministry work with the Bible Distribution Ministry (Seed For Harvest) with a friend and co-worker, Rick Carpenter. Mark jokingly laughed about the fact that age 49, he's just started to work seriously using his artistic talent. Again by use of the internet, he obtained some books about various artistic techniques that have helped him further develop his talent. He also has plans to take a water color course in the near future. Even though Mark may feel as if he’s got a late start at a career in the art world, it may be that his ability to "capture the real thing" may have needed that time to develop. One thing is for sure, any portrait he does speaks for itself and is definitely worth more than a thousand words. To obtain further information, Mark can be contacted at 931/823-6721. His mailing address is 1741 Dog Walk Road, Alpine, TN 38543. The exact likeness of Mark and Brenda Keisling's three year old granddaughter, Aubrie, has been captured by her Papa. Aubrie is holding a favorite doll named Michelle.